Three firefighters have been injured and about 500 buildings destroyed. One death has been reported - a woman's body was found in a burned-out area in Ventura County. But an official told the Ventura Country Star newspaper that the death, in the town of Ojai, may have been the result of a car crash not related to the fire. On Friday, US President Donald Trump issued a state of emergency in California, which will free up funding to "help alleviate the hardship and suffering that the emergency may inflict on the local population". About 5,700 firefighters have been battling the brushfires, officials have said, with firefighters drafted in from neighbouring states to help. The Thomas fire in Ventura County to the north of Los Angeles remains the largest of the blazes and has spread as far as the Pacific coast. It has consumed 180 square miles (466 sq km) since it broke out on Monday, and destroyed more than 430 buildings, fire officials said. 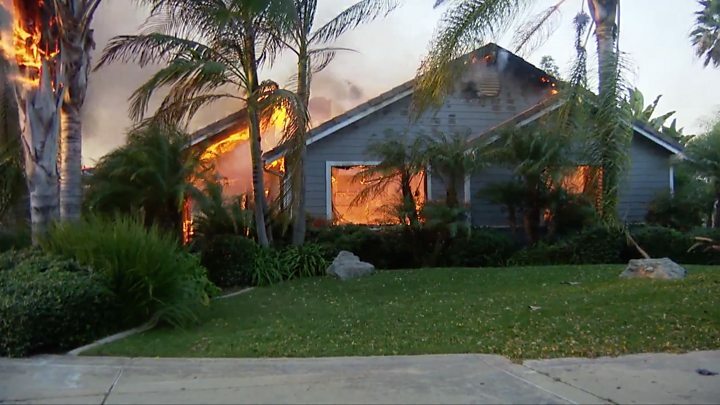 A BBC correspondent in Ojai says the blaze is burning in the hills all around and more than 100 fire engines have been seen driving through the town centre. A Reuters news agency photographer in San Diego county, site of the Lilac fire, described seeing propane tanks under houses explode like bombs. Some 450 elite racehorses in the area were let loose from their stables to escape to safety, the Associated Press news agency reports. Officials say at least 25 thoroughbreds died in the blaze. By Thursday afternoon local time, California's fire service said the blaze had forced the evacuation of 189,000 residents. California is entering its fifth day battling dangerous wildfires driven by extreme weather: low humidity, high winds and parched ground. Authorities have issued a purple alert - the highest level warning - amid what it called "extremely critical fire weather". Both the The University of California, Los Angeles (UCLA) and the Getty Center museum announced that they would reopen on Friday. Firefighters battling the Skirball fire had slept at the Getty overnight on Thursday. One in four schools in Los Angeles were also closed. In the wealthy Los Angeles enclave of Bel Air, firefighters were seen removing artwork from luxury homes on Wednesday as the Skirball Fire raged. The neighbourhood is home to celebrities and business leaders from Beyonce to Elon Musk. Singer Lionel Richie cancelled a Las Vegas performance for Wednesday evening, saying he was "helping family evacuate to a safer place". An estate and vineyard owned by Rupert Murdoch also suffered some damage. The media mogul said in a statement: "We believe the winery and house are still intact." The Los Angeles Times said Mr Murdoch paid nearly $30m (£22m) for the property four years ago. 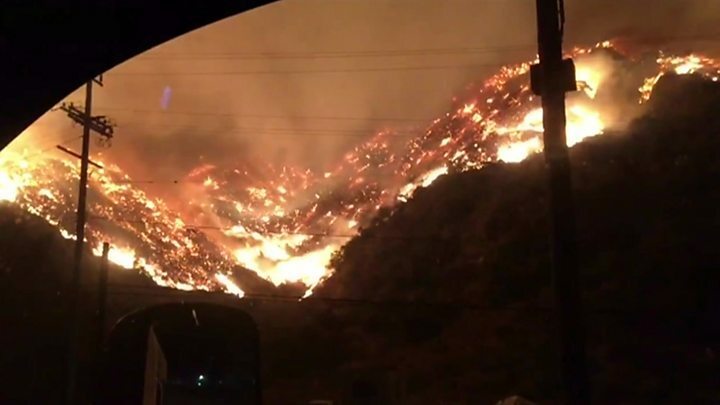 Another blaze north of Los Angeles, the Creek fire, was 20% contained and covered some 15,323 acres.